Teenager Bradley Warwick has always loved music. His biggest dream has been to perform in an orchestra. Unfortunately, Bradley was suffering from cerebral palsy – a life-long condition that affected all his limbs. Historically there haven’t been many opportunities for disabled children and young people to learn instruments that would allow them to pursue music professionally. One big challenge has been creating instruments suited to the needs of those with limited mobility. OpenUp Music in Bristol was established with just that aim in mind. Launched in 2013, the British non-profit has been working on developing instruments that can be played with any part of the body, including the eyes. 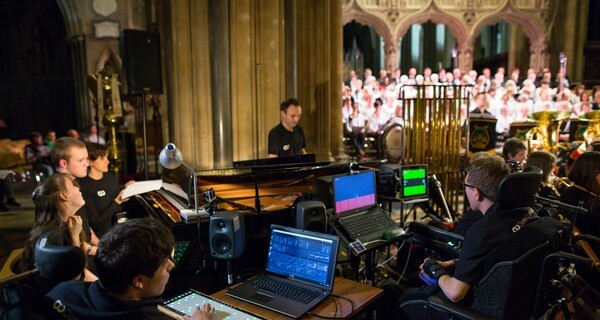 In 2015, the organisation launched the South-West Open Youth Orchestra (SWOYO) – the UK’s only disabled-led regional youth orchestra, delivered in partnership with musicians from the British Paraorchestra and the Bournemouth Symphony Orchestra. Up to 12 young disabled musicians aged 11–25 are provided with auditions, rehearsals and performance opportunities in fully accessible venues across the South-West in the UK. In 2015, following long hours of practice and a series of auditions on his specially adapted instrument that he could play with his eyes, Bradley was able to realise his dream and join the orchestra. Some of the highlights for Bradley and other musicians at SWOYO are performing at the House of Commons and Bristol Cathedral. This year, SWOYO reached a whole new audience with an acclaimed performance live on BBC Radio 3 for the BBC’s Music Day.